I learnt to drive some 20 plus years ago, but only drove for a couple of years, as living in Twickenham with buses, trains and underground at my disposal, I didn't need to use a car. Fast forward 20 plus years and having retired to Steyning with its lack of public transport, 1 bus every hour, I decided that I should take up driving again. Over the years confidence had waned and traffic increased. Steve took me on and with his patience, explanation of techniques, manoeuvres, etc and sense of humour, I have finally managed to get back to being independent again. The book and videos proved a great help and Steve often backed them up with other helpful videos/information. My instructor Steve was a great instructor. I would highly recommend him to any future student wanting to learn to drive. 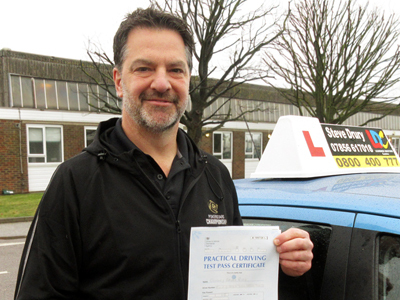 Steve has been a very patient and calm instructor – I’d had around 25 hours with a previous instructor, and in just over 20 hours with Steve I learned more than I can imagine and passed first time. I am over the moon with the help and support Steve provided and my only regret is that I didn’t find him sooner. The workbook came in handy – especially when I was struggling to progress with something or about to learn something new. It was nice to know I always had the book to hand to review. The videos Steve sent to me were also useful and it is good to have unlimited usage to something where you can see the technique being done as often as is necessary. On my lessons with Steve, he did everything at my pace, around my time and made the adjustments that would benefit me. The LD System was such a breath of fresh air for me and it was so nice to know Steve always had learning materials in the car for us to take a moment, stop and review ready for the next step. Steve was a very patient, calm and supportive instructor. He let me learn at my own pace, encouraging me to take new challenges when I needed more confidence. He was always punctual and very flexible with lesson times. I always felt safe, knowing I could make mistakes safely and he always talked through any mistakes and challenges I faced. I found the online system helpful in preparing for lessons and being able to visualise manoeuvres and techniques. The Theory preparation was helpful, especially practising the Hazard Perception ahead of the test. 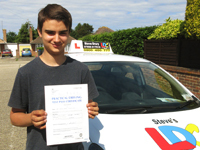 I am incredibly grateful to Steve for his support and guidance in helping me to pass my driving test. 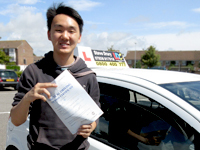 When I started lessons with Steve it was over 11 years since I had driven a car, but he took the skills I had learnt into account when planning my lessons. My lessons were designed to work on the areas that required focus and, particularly as we approached the test, we would plan the lessons together based on the areas where I wasn't so confident and needed work. 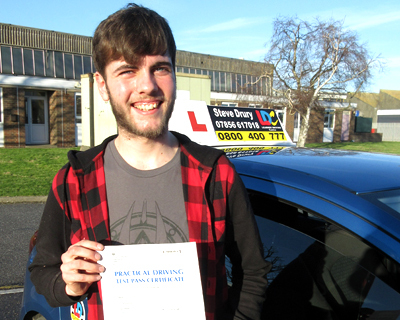 I believe Steve's flexible approach helped me to pass the test quicker than I would have otherwise, but more importantly, have made me a safer driver. 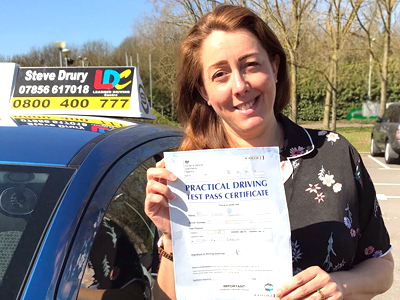 I found the LDC learning system was a great structure to work with, and the online videos, guidance and theory test questions were extremely useful. Thank you for all of your help Steve - I'll be driving my son to nursery in no time! What can I say! I’m delighted I have passed my driving test. 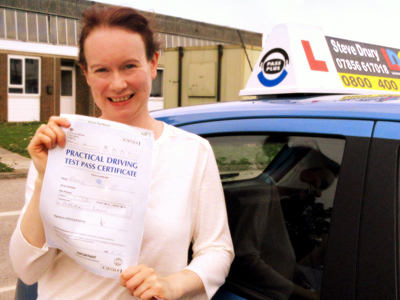 I had a goal that I wanted to achieve and I did it with the help of my great, understanding, lovely instructor Steve. I can’t thank him enough as he has taken me on a journey I thought I would never do. I’ve always been a bit nervous when it comes to driving due to a bad accident when I was young. I wanted to do this for myself and now I have a family of my own, I know how important driving is and how safe you have to be. Steve is a brilliant instructor; he is very calm and approachable, he will go into every little detail on what’s right and wrong and I feel I have learnt a lot. The driving school book was very helpful. It has everything you need to know and it’s easy to find a subject you want to learn about. 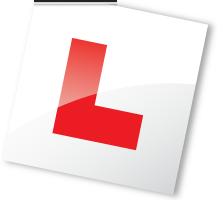 I looked a few times at the Theory Test online, but the DVD’s were better for me, as I learn more watching than reading. I would recommend the LD System to anyone! Thanks again Steve for everything you have done, it’s been a pleasure and I’ll miss you. Steve is Amazing. He was able to remove 30 years of old and not so good habits, so well, to get me a clean sheet on my test! His knowledge and patience was/is second to none. The videos, information and online tools were incredibly helpful. LDC is the way to learn. Highly recommended. Steve is a great instructor who really helps you understand the road and the car. I highly recommend Steve and the LD System as it lets you learn in a way that is comfortable for you. I received a workbook, many videos and diagrams to help me become a good driver, all thanks to Steve and the LD System. Steve Drury was a great teacher. He proved to be a true professional, who knows how to teach practical driving. He explained driving techniques in a simple way so the learner can easily understand how to approach various road situations. Apart from being an excellent instructor, he is a very nice, friendly person. 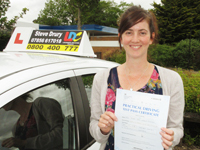 I enjoyed every lesson, passed the test first time and would certainly recommend Steve. I have had an excellent time learning to drive with Steve and the LD system. Steve was consistently punctual and always gave me good notice when changes had to be made to our schedule which made this easy for me to get time off work. The first few lessons I had with him were great and I made lots of progress in them. After this, we decided to start a 20 hour intensive course. Steve made a schedule that started from October 2017 and finished in January 2018. On the schedule that Steve gave me it had the dates, times, location and what we would be doing in the lesson. Knowing what we would be doing in the lesson was something I found useful because of the LDC student website and workbook. I was able to prepare myself for upcoming lessons and understand more about what I was learning to do through watching videos on the website and reading through the information alongside it. I found that this really helped me during the lessons. 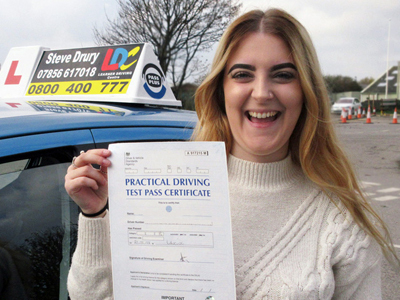 The LDC Student website also helped me pass my theory test as there were mock theory tests and hazard perception tests that I used to revise before it. Steve always worked with me when I made mistakes by helping me understand what I had done wrong but never made me feel bad. I am thankful that I had Steve as an instructor while learning because I wouldn't have passed without him! Thanks for teaching me Steve, I had great fun learning how to drive with you. I found Steve to be supportive, knowledgeable and very much invested in helping me pass. He customised his strategies to my needs and provided me with useful relevant resources to re-enforce my learning. I felt Steve's manner while teaching to be relaxed, informative and clear. I would and have recommended Steve to others. I passed my driving test 2 years ago with another instructor and had barely driven since. I was very nervous about getting back into driving. Steve definitely gave me the confidence to start driving again. He took into consideration what I needed and wanted to focus on for next lesson to ensure that I would get the most out of each of my lessons. Steve was great at discussing with me what I had done well and also, what I needed to improve on. He was very patient and was happy to spend as much time as I needed on anything before moving on. Steve was great at reminding me of the little things which will help me to become a safer and more efficient driver. He was always very professional and punctual throughout each of my lessons. My lessons with Steve were just what I needed to get back into driving again; in fact, as soon as I had my last lesson with Steve, I bought my first car (a matching white Vauxhall Corsa!!) and have been driving since. I would recommend Steve to anybody. Steve is a highly dedicated instructor. He pays attention to even the smallest details of your driving behavior and always has a good solution on how to correct the bad habits. 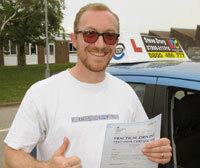 I would not hesitate to recommend Steve to anyone that is looking for a driving instructor. The Online Theory Test preparations was fantastic. It was easy to use and as it has the same set up as the real test, it prepared me not only from a learning point of view but also to get familiar with the format of the test. Steve is a great instructor. 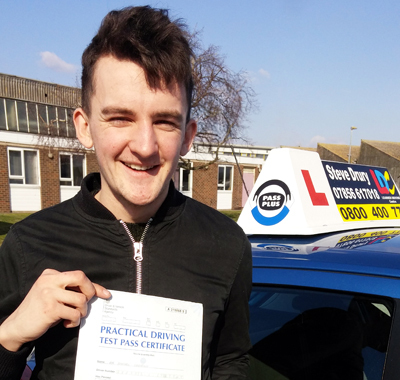 I did a semi-intensive course, and he got me to pass first time. He is very conscientious and will take you through all aspects with great knowledge and with humour! Thanks Steve for teaching me. Steve was always calm and helpful, and put me at ease before my test.